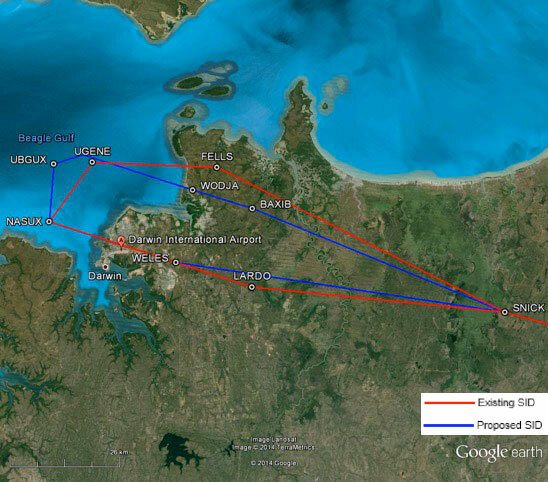 Airservices and Defence changed five existing flight paths to Darwin Airport from 28 May 2015. This followed a review of the existing air traffic control procedures and environmental assessment which was last reviewed in 2005. The changes were due to a number of factors including, increased aircraft traffic, maximising airspace efficiency and change in aircraft mix. 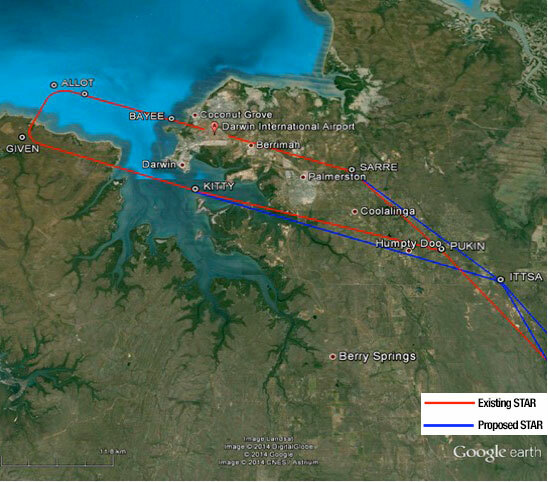 Changes were relatively minor and included three departure flight paths and two approach flight paths within the Darwin CBD region. The changes are shown below. The changes were not likely to be noticeable to the community due to the flight path distance being well away from residential areas, along with the high altitude of aircraft in both the previous and new tracks. Any changes in noise level would not be noticeable and the changes would not expose any new areas to aircraft noise. Airservices applied the Department of the Environment Protected Matters Search Tool to identify threatened habitats and ecosystems, threatened and vulnerable flora and fauna species, heritage matters, or other matters of environmental significance that may be impacted by aircraft noise as a direct result of implementing the proposed flight path realignment. As a result of the analysis, there was not expected to be a significant environmental impact from the proposed changes. An Environmental Assessment has been undertaken and is available. Smart Tracking has been successfully operating at Brisbane Airport since 2007. This procedures update enabled a wider range of aircraft to use Smart Tracking at Brisbane Airport. Flight paths for Runway 19 were made available for suitably equipped operators from 26 May 2016. Runway 01 flight paths were made available on 17 September 2015. The updated flight paths can be used by all suitably equipped aircraft arriving on to Runway 19 (arrivals over water to land at the northern end of the main runway) and Runway 01 (arrivals over the city to land at the southern end of the main runway). 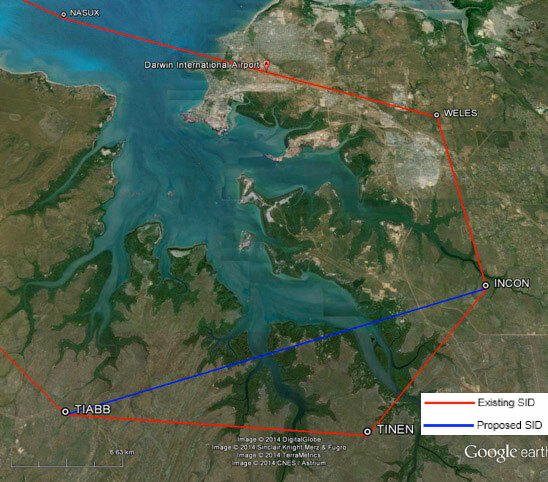 The updated flight paths closely replicated the previous flight paths, with minor changes occurring over water. The updated flight path from the north moved the flight path very slightly to the west, and the updated flight path from the south has a slightly wider turn radius as shown on the map below. Above: Current Smart Tracking flight paths (dashed blue outline) and updated Smart Tracking flight paths (from 26 May 2016) (yellow). The flight path from the north is expected to be used on average between five to 15 flights a day. The flight path from the south is expected to be used on average between 15 to 25 flights a day. As the updated flight paths closely replicate the previous flight paths with minor changes occurring over water, it is not expected there will be any change to aircraft noise. Some residents in the Queens Beach area on the eastern side of the suburb of Scarborough may visually notice a change in aircraft tracking. The updated flight path from the south replicated the previous flight path. The updated flight path from the north also closely replicated the existing flight path, however it has a slightly wider turn radius before crossing the Brisbane River in the Bulimba area as shown in the map below. 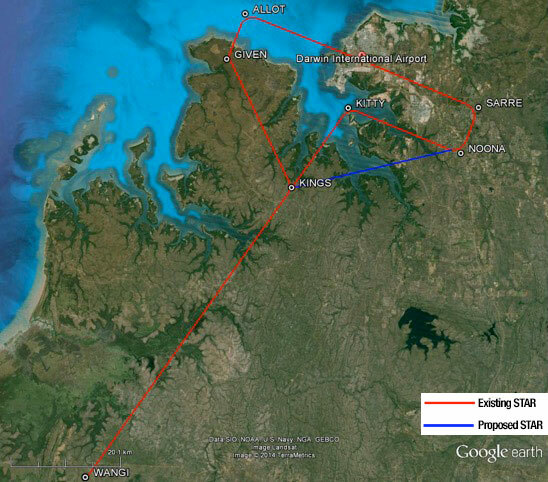 Above: Smart Tracking flight paths pre 17 September 2015 are shown with a blue dotted line, updated Smart Tracking flight paths (from 17 September 2015) are shown in yellow. The flight path from the north is expected to be used on average for six flights a day. The flight path from the south is expected to be used on average between two and eight flights a day. Although the flight path from the north is a small distance closer to the Bulimba area (200-300 metres), aircraft using it continue to be mostly within the previous flight path corridor. Our analysis modelled the Boeing 737-800 aircraft type, as it is currently the aircraft type using this flight path most frequently. The maximum noise level from a single flight over the Bulimba area is estimated to be between 68 and 74 decibels (dBA) (which is equivalent to the noise level of a passenger car travelling at 60 kilometres an hour at a distance of seven metres) and the expected change in maximum noise level for a single flight ranges up to +8 dBA. The updated flight path from the south replicates the current flight path, so the maximum noise level from each single flight will remain the same. To achieve the best aircraft safety, noise and emissions outcomes for Perth, Airservices made Smart Tracking technology permanently available on 17 September 2015 for all suitably-equipped aircraft landing at this airport. The Smart Tracking arrival flight path is over the Perth Hills to the southeast of the airport (shown in yellow in the map below). The visual approach (shown in blue) was also moved to replicate the new Smart Tracking flight path. Old visual approach flight path shown in blue. Smart Tracking and updated visual flight path shown in yellow.